How to Prepare for a Final Round Interview? So you finally got selected for the last round? Congratulations first of all! Your hard work has finally paid off. We know you are trying hard, not to be over confident and excited about it. But always appreciate your efforts and enjoy your successes and achievements. Recruiters during this period are not obviously interested in the last round of interview just to have fun. They are quite serious at this moment. It could make or break anything. You should be worried if you aren’t enough. In case you make a blunder, the job could slip off your hands. So how are you going to make a good impression? How are you going to look different and out of the box? If you have come so far, you can also try a bit more to finally make it to the top. And in this post; that is what exactly we are going to discuss. 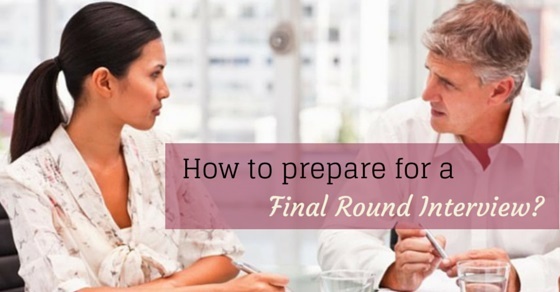 Here you will learn how to nail the final round of interview like a professional. 1. Show off a bit! This could be a great opportunity for you to show off a little bit. If you like bragging, this could be a good chance to nail that. Although most questions during this round will be mostly related to how well you can fit within the culture of the company, there are still going to be a couple of questions that will focus on verifying your skills. Your hiring manager would like to know whether you are suitable enough to adjust. So here you can brag! Candidates that display their narcissistic side have more chances of getting the job compared to those who don’t. So don’t let anyone misunderstand you one single bit. Just get to the point. The point here is to be careful while speaking. Don’t let them have the wrong impression about you. So don’t come off as arrogant and too proud of yourself. Yes, it must be a little difficult at times but the best way in which you can do this is by simply showing that you are very well aware of who you are, how weak you are in some places and the effort you are putting in order to improve that. You must show that you are conscious person willing to make a couple of changes here and there. When you acknowledge your mistakes and how hard you’ve been trying to make amends, you automatically make a great impression. Last rounds during interviews will always be conducted in the same location where you will be working. So it would not be a wrong thing to ask a couple of questions you have in mind. This will help you understand the environment you are about to work in. Not just that, you will have better knowledge about the work processes there. You don’t have to constantly keep nodding when you are being told something. Feel free to ask something. If you didn’t know, asking questions makes a good impression too. There are some interviewers who could get way too thrilled about telling you about the space in the office, the work environment and work culture. They sometimes forget to give you the chance where you can speak your mind. And this happens only when they are trying their level best to help you understand how beneficial and useful the job could be to you. But of course, this would be the last chance to nail it. Therefore, make sure to allow your seniors to give you a glimpse of how processes are carried out here. The whole point is to convince that the job is good enough for your benefits. Interviewing is no joke and we completely understand. But of course that shouldn’t stop you from enjoying a bit. If you are going to work in an office, you have to know what the people are like there. So a bit of laughter won’t harm you actually. It also create a good impression. They should see you as a fun loving person and that you can enjoy life that as well. That will also create a fine impression. Most importantly, you will learn how to build a rapport with the interviewer and who knows… maybe you will be the most remembered candidates of all times. Yes you should be comfortable and relaxed during an interview. But you also have to know when to get down and behave like a professional. Certainly there are going to be areas where you are expected to be serious and very dedicated. One example would be the role where you have to manage and handle meetings with clients. That certainly cannot make you laugh. But you must learn how to radiate some positive energy. Always observe every move of the hiring manager and try to understand when would be the right time to laugh and when you can answer questions like a professional. That will make a difference between you and any other candidate. The final round of interview is very important. You have to focus on saying those things that will sell you as the perfect candidate for the job. At this point, you will have some concern about the position you have applied for but maybe the final interview isn’t the time to focus on. In case your concerns are misinterpreted, there are chances you will not be getting the job. Once you have got a good job offer, you have much more leverage than any other regular candidate. So you can always speak about your concerns at that time. Try not to come across as someone who is too folksy or neighborly. This tends to make you drift away from the topics that need more importance. Being casual can be very deadly during interviews. One of the biggest turnoffs during final interviews is showing signs of disinterest. This happens when the candidate tends to be way too confident about nailing the interview. If you are distracted, you will not even be considered for the job anymore. Your chances are cut off right there itself. The hiring manager is present there to listen to you. So make it a point to stick to your plan and execute it like a professional. When you are answering questions during the final interview, please remember there are several others who have made it to the list along with you. So at this juncture the hiring manager is going to be very careful. One small mistake you will not get the job. Be confident and do not show any signs of hesitation while answering questions. If you come across as someone who isn’t very confident or isn’t sure of what he is saying, you are not going to get this job at all. There are many others who can answer questions better. So be mindful of that. One of the most common mistakes most people make while sitting for a final interview is presuming they have already got the job. Unless you have been offered the job and the salary has been discussed, there is no way you should believe you have nailed this. There are several others who are waiting to nail the job just like you. The interviewer will be in search of such a person who has an amicable personality, can mix well with people and doesn’t ruin the work environment. So please don’t presume, don’t get way too comfortable, be relaxed but not too much and answer all questions with confidence. During the final round, it is best to keep your flaws aside. So if you are an argumentative person, please leave that aside. This is quite tough for candidates to get past. Yes you will be asked difficult questions but that will be done only to see whether you will lose your cool or not. So make sure you are relaxed in that case. If you feel agitated, take a deep breath and smile. Always remember that last rounds are about finding that perfect balance. You will be speaking about your strengths and weaknesses, asking questions and displaying your professionalism and smart personality. So practise enough and prepare yourself at the same time. This will help you create a good balance and hopefully land the job too! On that note, good luck!